National producer of architectural cast stone. Find design details, pricing and ordering information in the catalog. Bill Russell is specified as the websites creator. Copyright 2007 Continental Cast Stone is the owner of the copyright for this website. 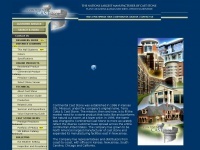 The web server used by Caststone.net is located near the city of Moorestown, USA and is run by Miles Technologies. The website Caststone.net has a own web server. The web server only runs this website. The websites of Caststone.net are hosted by a Microsoft-IIS server and were developed in the programming language ASP.NET. The markup language of the website is HTML 4.0 Transitional. Both the inclusion of the website in search engines and follwoing of its hyperlinks is explicitly allowed.